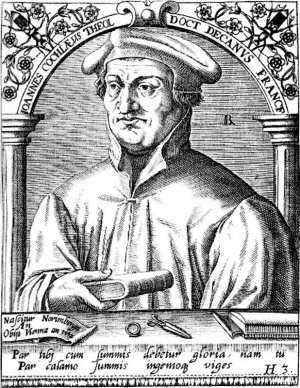 Johann Cochlaeus (1479-10 January 1552), like Eck, Emser, and Faber, was one of the most outspoken and active literary opponents of Luther and all other Reformation currents. His name was actually Dobneck (Dobeneck). He was born in Wendelstein in Franconia of peasant parents, attended the university in nearby Nürnberg, where he was closely associated with the Humanists Johann and Willibald Pirkheimer, whose influence on his career was profound. At the university of Cologne he was a fellow student with Karl von Miltitz, Count Hermann von Neuenar, Ulrich von Hütten, and Crotus Rubianus, all of whom were prominent fighters of the Reformation period. His Nürnberg connections secured for him an office, a living, and recognition as a school rector in the city on the Pegnitz. In Nürnberg he also became associated with Dr. Gerhard Westerburg (Rembert, Wiedertäufer, 43, 118, 188), known in Anabaptist history. He spoke with enthusiasm of Ulrich von Hütten, entirely in the manner of the enemies of Rome. But in Rome on a tour of Italy he was promptly won for Rome and consecrated to the priesthood (1518). After zealous study at Rome he finally received through the papal chamberlain von Miltitz a German benefice, the deanery at the Liebfrauenstift at Frankfurt. The letters written by Cochlaeus to several papal delegates reveal that he was writing histories of earlier heresies, in order to attack the reformers. Thus in May 1521 he was editing a book against the Waldenses following an old codex, Ubi errores eorum (quibus novus hic haereticus participat) solidis reprobantur scripturis. The second of his numerous works is the Historia Alberti Krantz von den alten hussen zu Behemen in Keisers Sigmunds zeiten (Strasbourg, 1523). More than 20 years later (1549) appeared his Historia Hussitarum libri XII (Friedensburg, 253 ff.). Cochlaeus is best known for his uncommonly coarse polemics against Luther. Against his old schoolmate Westerburg (also called Doktor Fegfeuer), who in 1523 had published Vom fegefewer und standt der verscheydten selen, he wrote a tract dedicated to Duke Karl of Gelderland and Jülich, Von Christgläubigen Seelen im fegfewer, wie yhn hilff und trost vonn lebendigen in Christlichen Kirchen geschehen soll (1526). Naturally Westerburg did not fail to reply (Rembert, 43). In 1527 Cochlaeus heard of the seven articles of faith of the Anabaptist Jakob Kautz at Worms. The pamphlet of the "heathen" Kautz, signed by "Ulrich Preto and Johannes Fryher, preachers at Worms with their Brethren," with the Anabaptist doctrine of the distinction between the outer and the inner Word, infant baptism, transubstantiation, the emphasis on discipleship, etc., receives from Cochlaeus a more than superficial refutation in Articuli aliquot, a Jacobo Kautio Oecolampadiano, ad populum nuper Wormaciae aediti, partim a Lutheranis, partim a Johanne Cochlaeo doctore praestantissimo, reprobati (MDXXVII). It would be surprising if this passionate opponent of the Reformation and all Protestant endeavors had not occupied himself with the tragedy of the Anabaptists at Münster who, besieged by their deposed bishop, sent flaming leaflets and challenges into the world. In 1534 Nikolaus Faber at Leipzig printed a small volume by Cochlaeus with the title, XXI Articuli anabaptistarum Monasteriensium, per Doctorem Cochleum confutati, adjuncta ostensione originis, ex qua deflexerunt. Appendix elegans, Ex Epistola Petri Plateani, Marpurgi in Hassia data, quae de anabaptistis et de civitate Monasteriensi multa commemorat. (The same booklet also appeared in German, without the letter of Plateanus.) Again Cochlaeus exploited the opportunity to prove the Münsterites to be genuine disciples of Luther, who merely drew the logical conclusions from Luther's heresy of 1520. Otherwise it contained nothing new. In the same year besides the German edition of the 21 articles there appeared a booklet, Von neuen Schwermereyen sechs Capitel, den Christen und Ketzern heyden nötig zu lesen und höchlich zu bedenken, der Seelen Seligkeit betreffende (Spahn, 183) at the end of which he deals with the Anabaptists and their presumed predecessors, the Arians, Donatists. But anyone hoping to find an original idea on the 15 pages will be disappointed. For Cochlaeus Luther is always the founder of the dangerous sect; compared with it the Anabaptists are insignificant. Hence his writings (Catalogus brevis eorum, quae contra novas sectas scripsit, 1548) yield little for the study of Anabaptist history. Frie­densburg, W. Fortschritte in Kenntnis und Verständnis der Reformation (in the series Schiften des Vereins für Reformations-Geschichte, No. 100, 1910): 40. Grisar, Hartmann. Luther, 3 vols. Freiburg, 1911-1912: passim. Hege, Christian and Christian Neff. Mennonitisches Lexikon, 4 vols. Frankfurt & Weierhof: Hege; Karlsruhe: Schneider, 1913-1967: v. I, 365. Herzog, J. J. and Albert Hauck, Realencyclopedia für Protestantische Theologie and Kirche, 24 vols. 3. edition. Leipzig: J. H. Hinrichs, 1896-1913: IV, 194-200. Kawerau, Gustav. Deutsche Literaturzeitung (1898): 1005. Otto, Karl. Johannes Cochlaeus, der Humanist. Breslau, 1898. Schlecht, J. Hist. Jahrb. (1898): 938. Spahn, Martin. Johannes Cochläus: Ein Lebensbild aus d. Zeit d. Kirchenspaltg. F. L. Dames, Berlin 1898; Reprinted: Nieuwkoop : B. de Graaf, 1964. Rembert, Karl. "Cochlaeus, Johann (1479-1552)." Global Anabaptist Mennonite Encyclopedia Online. 1953. Web. 25 Apr 2019. http://gameo.org/index.php?title=Cochlaeus,_Johann_(1479-1552)&oldid=120964. Rembert, Karl. (1953). Cochlaeus, Johann (1479-1552). Global Anabaptist Mennonite Encyclopedia Online. Retrieved 25 April 2019, from http://gameo.org/index.php?title=Cochlaeus,_Johann_(1479-1552)&oldid=120964.